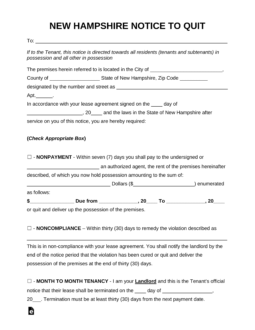 The New Hampshire eviction notice forms are documents that may be utilized to either inform a tenant of an impending eviction if things don’t change, or to let the other party know that you don’t intend to renew a month-to-month lease. In New Hampshire, if a tenant is not paying rent, a landlord must deliver both a Demand for Rent and an Eviction Notice. The tenant will have seven days to respond. If there is no response, landlord may proceed with obtaining a a Writ of Possession from the Local District Court. The landlord will have to include copies of the notices delivered to tenant, and an Affidavit of Damages. 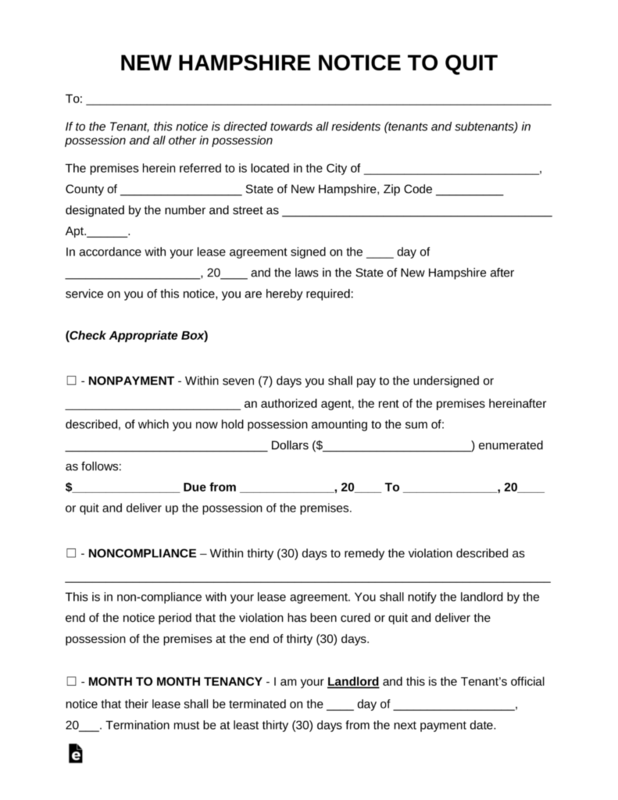 Eviction Checklist – Simple guide provided by the State of New Hampshire to guide landlords and tenants on the process for an eviction. Non-payment of rent – 7 days’ notice and the Demand for Rent is required to be attached. 30-Day Notice to Quit (Month to Month) – This form is for use when either party wishes to end a month-to-month tenancy. Rent is due on the state specified in the lease. If it is not received by the landlord on that date, it is considered late and landlord may proceed with a demand notice. Step 1 – In New Hampshire, before a landlord can begin eviction proceedings, he or she must inform the tenant of any breach of the lease and give them an opportunity to fix it. If it is a breach for non-payment, landlord must deliver a Demand for Rent and an Eviction Notice and give the tenant 7 days to pay. If it is for another breach other than non-payment of rent, landlord may provide a non compliance notice (Notice to Quit (For All Lease Violation Types). In addition, the Appearance Form will schedule a hearing date and there will be a fee assessed in the amount of $125 plus $1 for the Writ (NHJB-2333-DP). Step 3 – If the Judge rules in the favor of the landlord then a Writ of Possession will be issued. This form must be taken to the local county sheriff’s office and a legal lock-out of the property will be conducted if the tenant does not vacate themselves. The Addressee of this paperwork must be documented at the top of this page. Report his or her Name on the blank line after the word “To” below the Title of this Notice. It will be important to pinpoint the location of the premises being referred to. This information should be found on the Rental Agreement then input across the blank lines in the first statement (in this order) City, County, Zip Code, Building/Street, and Apartment. Finally, it is time to solidify the Rental Agreement the Notice concerns by citing the Signature Date of that Lease for that premises in the second statement. Use the three blank lines here to report the Calendar Date, Month, and Year of the Signature as reported on the Rental Agreement. If this Notice is a Notice from a Landlord to a Tenant, then select one of the next three statements and proceed to Step 5. If this Notice is from a Tenant, then skip this section and Proceed to Step 4. Choose the “Nonpayment” Notice to give the Tenant Seven Days to remit payment for an overdue rent or abdicate his or her right to remain on the Leased Property. This type of Notice requires the Name of an alternate Authorized Agent to receive the payment. The Total Amount of Rent Due, the Rent Amount Required to be Paid, and the Rental Period this Amount this payment will apply to on the blank spaces provided. Choose the “Noncompliance” Notice to give the Tenant Thirty Days to correct his or her violation of the Lease Agreement or to leave the premises and yield control of the Property to the Landlord. Choose the “Month to Month Tenancy – I am your Landlord” Notice to give a Tenant in a Month to Month Lease at least Thirty Days ‘Notice until the Lease expires. This Date must be defined on the three blank spaces by entering the Day, Month, and Year it will end on the first, second, and third blank spaces. If you are a Landlord or Authorized Agent of the Landlord, proceed to Step 5. If you are a Tenant defining the Termination Date of a Month to Month Tenancy for a Landlord, then choose the “Month to Month Tenancy – I am your Landlord” Notice. Fill in the Day, Month, and Year of this end date on the first second and third blank lines. This date must be Thirty Days or more from the Landlord’s receipt of this Notice. If you are a Tenant, proceed to Step 6. Landlords and/or their Agents that issue this Notice must provide their Signatures on the designated line “Landlord/Agent Signature.” This may be found below the paragraph near the bottom of the page.